We know how to SURVIVE & THRIVE beyond cancer. Founded in 2009 by Donna Wilson, James Lozada, and Jennifer Merendino, Empire Dragons NYC is New York City's first and only breast cancer survivor team comprised of members from throughout the tri-state area. In addition, we are one of over 150 breast cancer survivor teams worldwide that serve to promote the sport of dragon boating as part of a healthy lifestyle and provide a unique support for those fighting cancer. Empire Dragons NYC is an active member of the IBCPC, International Breast Cancer Paddler's Commission. Although many of our races are IBCPC sanctioned, there are several races during the season which also include members with all types of cancer. 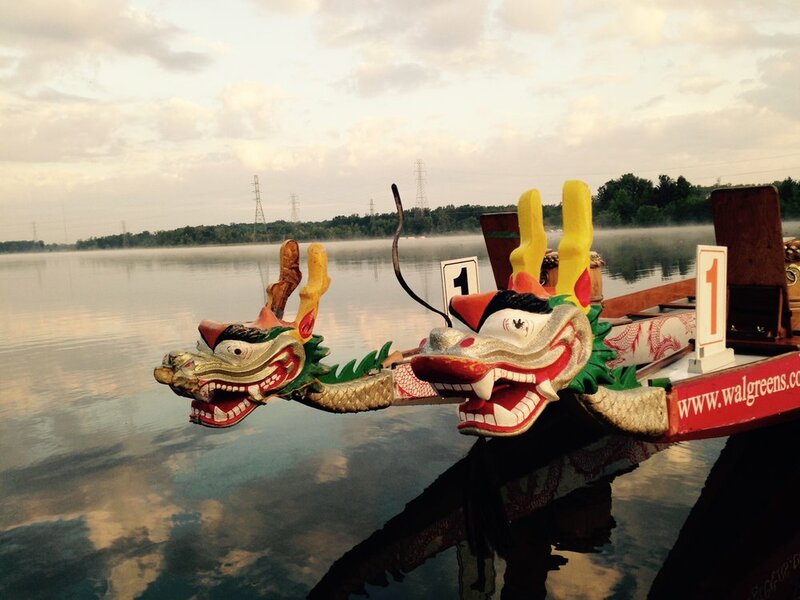 We are a competitive racing team, and during our season, we participate in up to six dragon boat festivals in the northeastern United States and Canada. Empire practices several times a week at the World’s Fair Flushing Bay Marina, and the team also meets on and off season for physical training and cardio fitness. Empire is dedicated to empowering women to survive and thrive beyond cancer. We work to improve the environment in which we all live, as well as promoting exercise and nutrition as a means toward a healthy and fulfilling life. We are a green team – committed to improving the health & environment of all New Yorkers. To this end, we are dedicating our time and resources to several projects to call attention to the water quality around New York City.Empire Dragons NYC is a founding member of the Guardians of Flushing Bay (live link). Together we sponsor an annual Flushing Bay Marina clean-up day in memory of one of our founders, Jennifer Merendino collaborating with Riverkeeper and the New York City Department of Parks & Recreation. In addition, we participate in other environmental initiatives including: oyster gardening in collaboration with Billion Oyster Project, and water quality testing in collaboration with the New York City Water Trail Association. In addition, the team is a member of S.W.I.M and the Metropolitan Waterfront Alliance. What is Dragon Boating you ask? Modern Dragon Boating is a paddling sport which has its roots in an ancient folk ritual of contending villagers, which has been held for over 2000 years throughout southern China. While competition has taken place annually for more than 20 centuries as part of religious ceremonies and folk customs, dragon boat racing has emerged in modern times as an international sport, beginning in Hong Kong in 1976. Today, races are measured in meter distances. Typically a sprint race is 200m or 250m, with 500 meters being the most common. 1000 & 2000 meter distances are considered endurance races. Dragon boats are generally rigged with decorative Chinese dragon heads and tails, for races and other events. 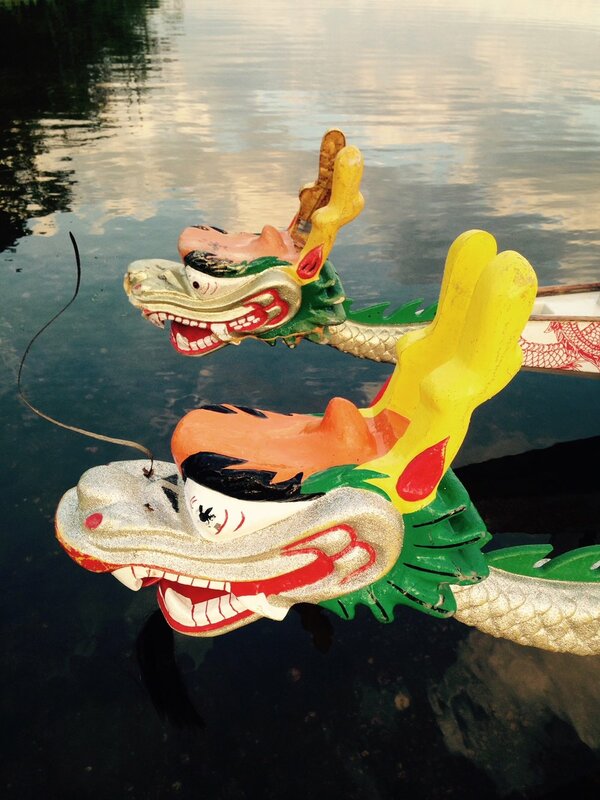 A typical Dragon Boat weighs approximately 600 pounds when empty and can weigh up to 2 tons when filled. Most Dragon Boats consist of 20 paddlers seated side-by-side. The steersperson is in charge of the boat and stands strongly planted at the stern maneuvering the steering rudder oar and calls out race commands while guiding the boat through the race course. The drummer sits high on the bow and synchronizes their drumming strokes with that of the leading pair of paddlers at the front of the boat. The stroke is technical with each paddler extending forward with rotated torso to maximize the reach and length of the paddle stroke. We do not need to bring our own boats to festivals. All boats are provided by the festival hosts and conform to the rules and standards of the International Dragon Boat Federation. Paddlers may bring their own paddle however, it must conform to the International Dragon Boat Federation (IDBF) Racing Paddle Scheme. This helps ensure that when a competitor purchases a Racing Paddle he or she buys one which is made to the IDBF Racing Paddles Specification. Paddles can be made of carbon fiber, wood, or combination of both.